Daily Rantings: Will you eat this ? 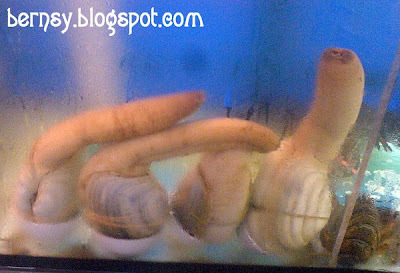 It's called Geoduck or "Jeong Bak Phong" in cantonese. Very pricey delicacy...best eaten sashimi style or dipped into boiling herbal soup. Slurps! Yea its Geoduck (pronounced as "gui-duck"). If eaten raw, it tastes like sashimi, if you cooked it, is tastes like abalone. Go for the Canadian ones and avoid the Mexican's.